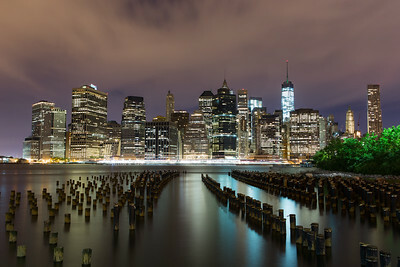 Professional New York City photography, acrylic face mounts, fine art prints, stock photography, and high resolution downloads by Andrew Rhodes. 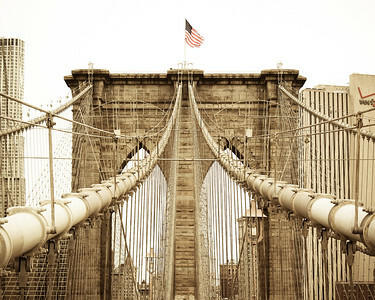 Brooklyn Bridge, Empire State Building, Times Square, the Freedom Tower and more. 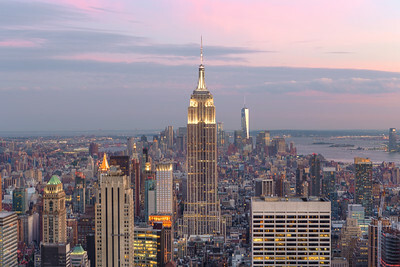 The bright lights of New York City fill the night sky as dusk settles over the city. 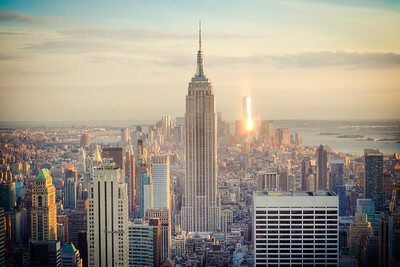 The Empire State Building is to the left, with the new One World Trade Center slightly to its right in the distance. 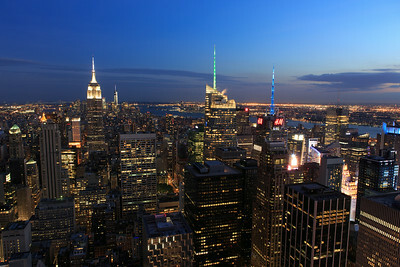 Times Square occupies the center right of the view with its colored lights and now iconic Bank of America and New York Times towers. 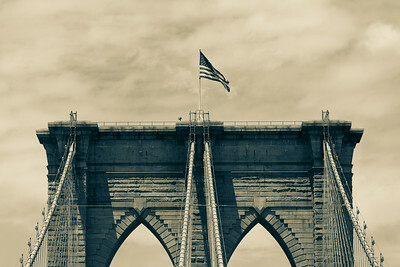 The west tower of the Brooklyn Bridge rises above the East River as it arcs into downtown Manhattan in New York City. 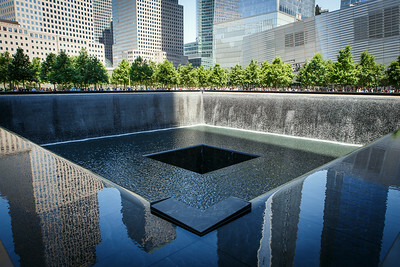 One of the two pools of the World Trade Center memorial in New York City, with a bit of the new One World Trade Center tower reflecting just to the right of center on it's way to it's now final height of 1,776 feet. The designers have done an incredible job with this massive, peaceful, and somber memorial to such a horrible event. 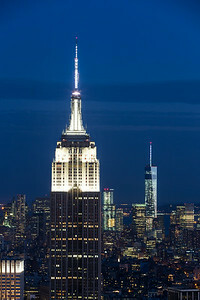 Two of the three most famous tower of New York City... the ageless Empire State Building and the gleaming new One World Trade Center, both glowing in white as dusk settles in over New York City. Tom's Restaurant a.k.a. Monk's Cafe as known to millions of Seinfeld fans around the world. 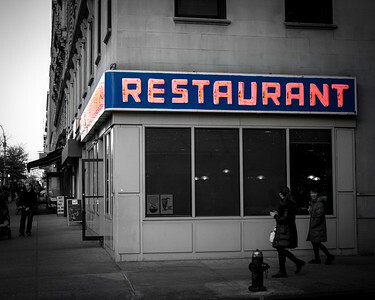 Located near Columbia University in Upper Manhattan, the restaurant has become an icon of students and Seinfeld lovers alike. 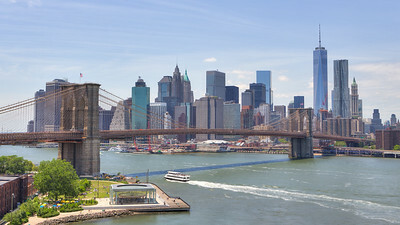 The Brookyln Bridge arches over the East River on its way into downtown Manhattan in New York City on a beautiful summer day. 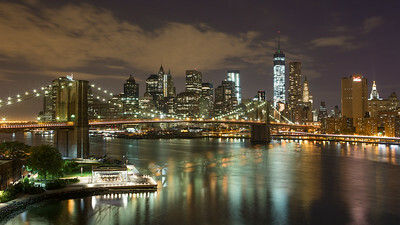 The stunning night time skyline of lower Manhattan in New York City, as seen from the Manhattan Bridge. 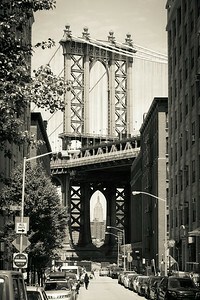 A view of Manhattan Bridge from downtown Brooklyn with the Empire State Building making an appearance through the tower arch. 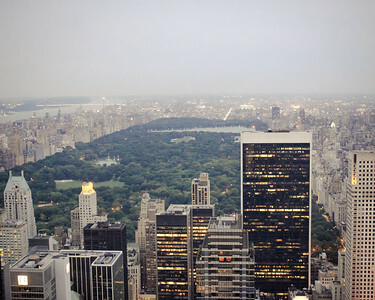 Central Park from above in a dreamy view of the NYC skyline. It amazes me every time how big it really is. Bring home the non-stop action of New York City with this stunning isolated-color print of NYC taxis zipping through Times Square. 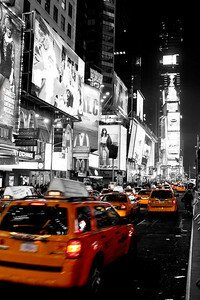 Shot the day before New Years Eve, Times Square was absolutely packed with tourists preparing for the festivities. Truly an amazing time to be in the City, and an amazing item to add to your decor. 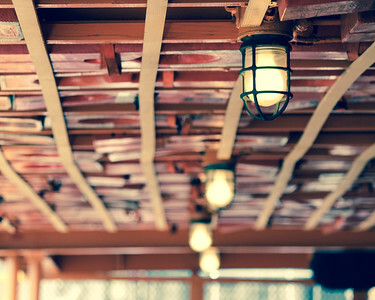 The lights of the Staten Island Ferry and it's life preserver-laden inside roof. 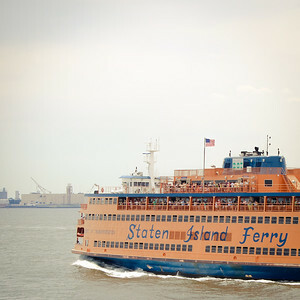 While handy for tourists who want to see the harbor, the ferry transports thousands of New Yorkers to work very day between Staten Island and Manhattan. 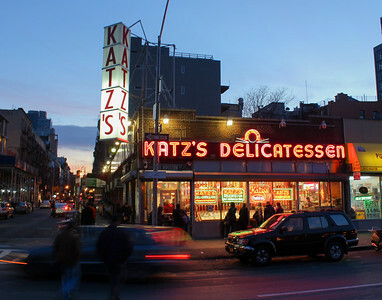 Of all New York City's famous delicatessens, few are more recognizable than Katz's Deli. Site of Meg Ryan's famous "I'll have what she's having" scene in When Harry Met Sally, the deli is also known for its amazing pastrami sandwiches. After a full day of capturing NYC, a gorgeous shot of Katz's at dusk was all I had left before I had to find out for myself.